Guess where I'm at right now? I'm in Des Moines because we have just received a new car. A 2011 Chevy Malibu. It's pretty nice but I think everyone who knows me knows what I think about Chevys. Anyhoo, we have had a little excitement this week. Yesterday at church Bro. 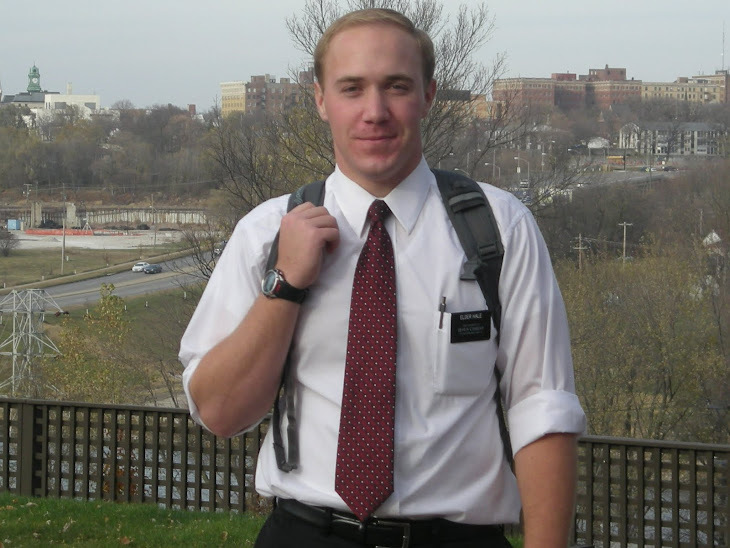 Hansen walked up to us right before Priesthood meeting and told us that a kid by the name of D M wanted to be baptized. We just looked at him and asked who's D? (we didn't know him). He said that it was his sister's grandson who is about 10 years old and has been coming to church had asked if he could get baptized. We have been praying for a baptism but we didn't think that it was going to slap us in the face like that. Pretty cool. We also got a referral from the zone leaders about a kid named J. Hes only 20, going to school, and had a 1 year old son. We went over to go see him, and he is so sincere about finding and going to a church here in the area. He wants the best for his son, so we have been really hitting hard on family principles. We have a church tour lined up for him tomorrow which we are excited for. And guess what, Elder Noel and I were over in Manson doing a little tracting Saturday night, and I guess we were hitting the pavement so hard that someone called the police on us. It is a real small, tight-knit (catholic) town and while we were tracting, a policeman pulls up in the driveway where we were currently knocking on a door and asked what we were doing and for identification. All I had was my ministerial certificate, so he took our names down and tells us that someone down the street called in because they thought it was weird that we were knocking on doors after dark. Manson was a interesting town. This week our Mission President has approved and issued texting! 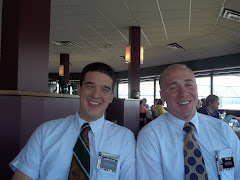 Its weird to be a missionary texting people, but some people just won't answer our calls, but they will text us. I never thought this would ever be a part of missionary work. First Presidency Approved! Mother, I have yet to get you the pictures that you wanted. I was going to do it this morning but I forgot, I'm on it though! Sounds like you got my package that I sent. Dad I want see you in those t-shirts, I thought that you would love them. As for the pictures I'll try to get a good one to you. I actually am sending season greeting cards out this week, they are pretty cool I think. Before I go on too far, I need to tell you that I shook the hand on an apostle on Saturday!! Elder Nelson came to stake conference here in the area, but on Saturday there was that World Wide Leadership broadcast. President Jergensen wanted all of the district leaders in the area to go to it, so we traveled to Ames. He was there, so after the broadcast Elder Noel fullbacked his way to the front of the chapel, while I was the running back behind him. We hit the gap between the elderly and hurtled our way over a wheelchair, only to put a spin move on bishop, (you know how crowed a chapel can be after a long meeting, every one has to mingle). We finally made our way over to him and we both were able to shake his hand! 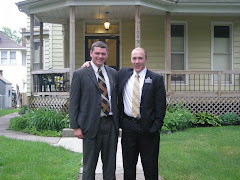 Elder Brimhall (I think that is how you spell it) of the Seventy was there and I shook his hand too. They both gave wonderful talks on Sunday which were very inspiring. Elder Nelson gave a apostolic blessing over the area which I had never heard of before. It was amazing. Here in the Fort Dodge area we are working closely with an ex-communicated woman. She was a media referral that we received, and she came to Stake conference. She is really enjoying us come by to teach her and feel of the spirit. Our progressing family didn't come to church this week, we were a little disappointed about it, but were are going to commit them to baptism on Tuesday, we are praying for them. We have a whole bunch of new investigators like I told you last week, but only 3-4 of them I think are sincere about actually progressing. I think getting a 2nd appointment is harder than the 1st. I also have to tell you we had the first sighting of snow this week. We woke up Friday morning and it was snowing. I was bummed, snow already. I got some pictures, it wasn't much but it was still cold. It's been real cold this past week, Wednesday it was 64 degrees and Friday, snow. Welcome to Iowa. Some members in the ward bought Elder Noel and I some beanies, I've been sporting it ever since we got them. Your package came in perfect timing. We were out tracting all afternoon in the rain and wind on Thursday and came home for dinner only to find a package of cookies and the best hot chocolate!! It was a great. The Trunk-or-Treat was really fun and I got some pictures of that stuff and my costume. I forgot to tell you that a couple of weeks before the Trunk-or-Treat, the Primary had a activity and they invited the missionaries to come teach them about how to talk to their friends about the gospel. So we went and taught them then we practiced how to do it. At the end of the activity I promised the kids that if they would bring a friend to the Trunk-or-Treat the missionaries would have a prize for them. Then the little girl runs up to me (her name was A) and she said "I don't want candy, I want a cantaloupe!" I was like ok, what ever you want, you just have to bring a friend. So Friday comes around and she comes running up to me right at the start of the Trunk-or-Treat and says "where is my cantaloupe? I brought my cousin and she doesn't go to church!" I was like oh boy she really did it. So at church on Sunday I brought that little girl a cantaloupe, every one thought it was the funniest thing they had ever seen. I even had to get a picture with her and the cantaloupe. But on Saturday night all cars were grounded at 6 pm and we had to be inside for the night, the same went for Sunday night because of all the trick or treaters. But we were allowed to go over to a members home for the night as long as they provided the ride. So Sunday night we had dinner with Bishop and his family, and even got to teach a lesson to his daughter's boyfriend. So all and all it was a good night. D dropped us this week. It was the weirdest thing. We were not able to get her to come to church the past 2 weeks because she kept bailing out at the last minute. So we called her to set up a time we could come over and talk to her about what had been going on. She just told us that she didn't know if what we were teaching was true and she wanted to find out on her own. she did not want us to stop by any more, or talk to her. We finally were able to get her to let us stop by and say goodbye and say a prayer with her. so we did and it actually was a good visit, but from what we understood from it was that she just did not recognize the Holy Ghost, so we explained her feeling that she had, said a prayer and gave her a blessing, and left. She said that she would call us in the future and would continue to read the Book of Mormon (she read all of 1 Nephi up to this point) So the ball is in her court and we will try to go see her in a few weeks or so. Kind of a bummer. Other than that just the same stuff.